As a women-led business, the WhyWhisper team understands the unique challenges that women face in the workplace. In fact, one of our founder’s motivations for starting our firm was her desire to build a business that supports women and have the opportunity to influence others to do the same. In many professional settings, women experience debilitating bias, both unconscious and otherwise, and are forced to learn how to navigate through it. Figuring out how to do this alone isn’t easy, and perhaps the most powerful way that women can support each other is through the sharing of stories and learnings in a raw and honest way. Many women have an array of personal and professional goals that don’t fit any specific mold or path, but the need for support by way of real answers to real questions is prevalent across the board. That’s where Changemaker Chats come in. 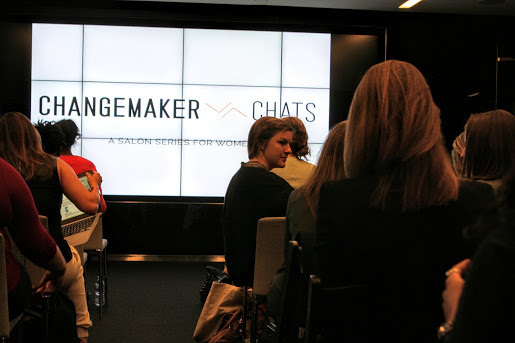 Changemaker Chats are intimate salons that bring women together to share their experiences and build relationships, while learning practical tips to advance positive changes at work, at home, and in their communities. So far, they are in 4 cities, including New York City, Washington, D.C., San Francisco, and Boulder. They’ve hosted speakers such as Kathy Calvin, President & CEO of UN Foundation, Sukhinder Singh Cassidy, Founder and President of Joyus, and Helene Gayle, CEO of McKinsey Social Initiative. What led you to start these chats initially? It’s no surprise that women care deeply about excelling in our jobs, achieving happiness at home, and being forces for good in our communities. When we would get together for drinks, our conversations often touched upon all of these topics. Yet, inevitably we'd find ourselves asking questions about how other senior women achieved their goals, how they handled challenges in the workplace, had navigated different career decisions/transitions, and how they balanced their professional ambitions with personal goals. To answers these questions, we’d typically turn to the usual advice: reading the latest books and advice columns, seeking out women leaders for guidance, and turning to our friends to ask questions we were afraid to ask others. But we realized this approach was inefficient and, often, ineffective. There are not enough hours in the day to read everything! Even if we could, much guidance comes from women who are not yet in the upper echelons, or from women who are but cannot speak the raw, uncut truth publicly. One-on-ones with women leaders are hard to pin down, so we go to our friends for counseling, which doesn’t work as well when we’re all looking for the same advice. We'd had enough! And so we decided to start Changemaker Chats as an effort to leverage our collective networks of like-minded women to overcome these challenges, and hear ‘real stories’ from inspiring women. How is Changemaker Chats different from other forums or networking groups for women, and why does it matter? The primary purpose in attending a Changemaker Chat is not to network. Networking is a nice by-product of the experience, but it is not the reason why we started the chats, and it is not the primary reason why women attend. Women attend our chats to invest in themselves, and that happens in various ways. For some women, it might be a treat to hear from a speaker she has long admired. For others, it may be a chance to connect with other women, hear their stories and disconnect from work. And then for others, it may be a night away from their kids to hang with other women in their communities who care about advancing positive change. (Just ask our mamas in Boulder!). We also care a lot about inclusion. For us, there is only one prerequisite for the chats: you must care about advancing positive change in the world. The chats are an authentic, in-the-moment experience. No phones, no live tweeting, no pitching. We are there to ask those questions that have been tough to ask, in a setting that is private and real. How has Changemaker Chats changed over time, and how do you envision them evolving as you move forward? We've grown! However, the format and quality of the chats remains consistent throughout. It’s important for us to create an atmosphere where we can be open enough to explore so many topics and issues pertinent to women but in a way that remains interesting, respectful, and insightful. Going forward, we’re excited to continue offering our staple ‘chats’ while building out new offerings that help women take deep dives into the very real challenges we face. We’ve started testing these workshops in New York and so far – with workshops on goal setting and taking risks – they have been received really well. We’re excited to expand moving forward. What has been the most rewarding part of creating this space for women? Do you have any particular stories that come to mind? First is that, at the beginning of each chat, we ask each woman to introduce herself and share where they work or their field. With so many impressive, diverse women sitting in one place, this is the moment when you realize, “Wow these women are amazing.” We love it every time. Second, we love hearing women in our network tell us that a chat changed her perspective, or encouraged her to take a risk that she wouldn’t have otherwise without having been inspired by a chat. This happens all the time. Finally, we love hearing how chats have offered practical, actionable advice to women – whether that is negotiating a raise, landing a new job, or overcoming a difficult situation. We get this type of feedback often, and it makes the chats all the more worth it. Following last month’s Women’s Equality Day, we wrote about how one of the places where women are still unequal is in the workplace. Do you have any advice for women who want to step up as leaders at work, but are experiencing barriers in doing so? Leading with head and heart: When thinking about leadership, we all need to craft our own style. – Peggy Clark, VP of Policy Programs, ED of Aspen Global Health and Development, and Director of the Alliance for Artisan Enterprise at The Aspen Institute. We'd encourage women to check out some of what our speakers have shared, and join us at one of our upcoming Chats. And if you don't see a Changemaker Chat network in their city and are interested in starting one, we’d love to hear from you! We’re so inspired by the work that Jessica, Briana, and all of the women involved with Changemaker Chats are doing to support one another and build safe spaces to learn from and connect with one another. We can’t wait to see what they do next! If you’d like to follow along, check them out on Twitter, Facebook, or LinkedIn. If you know of a women-led business or organization that is changing the game for women, tell us about them! We’d love to connect with them.